In some cases no treatment is necessary if the condition lies dormant, causes no problems and and does not progress. Surgery to straighten bent fingers has long been the established method of treatment, but in recent years new treatments have become available to deal with the earlier stages of the disease. Treatments such as Radiotherapy and Collagenase injections are now available on the NHS depending on the local CCG’s funding, and all treatments are available from private clinics in the UK. Every treatment has it’s own risks and possible side effects, therefore the decision what treatment to opt for should be discussed with the doctor who would be giving that particular treatment. Not everyone gets side effects, but you need to know what may happen and be prepared for it. You can download a PDF of our TreatmentLeaflet here, to see what treatment is possible at what stage. For an explanation of the treatment options by some of Britain’s specialist doctors please watch our webinar. In cases where treatment by injection or surgery is not yet required some people would like to try massage or exercises to keep their hand and fingers as flexible as possible. Although this has not been proven to stop the need for surgery, a lot of patients find it benefits in reducing pain and maintaining handfunction longer. 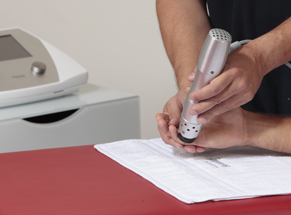 Radiotherapy – shows promising results of halting or slowing any progression of the disease, but has minor side-effects, such as dry skin and is not always effective. It is only effective during the active or proliferation phase when nodules are growing and cords may be developing. This is often accompanied by symptoms of soreness, tingling, aches, and so on. If there are no signs of activity then you should wait and see, but examine and possibly photograph your hands regularly for signs of changes. Corticosteroid injections – such as Triamcinolone have been used with some success by some Doctors but are not recommended by NICE in the UK. Needle Aponeurotomy – is a good option if any contracture is not too severe and if the cord is well away from tendons and nerves in the hand. Collagenase injection ( Xiapex) – Has good results for contracture but carries a small risk of tendon rupture. It works by dissolving the strands of tissue in the cords or strings. Some patients need may a second injection. In most cases the contracture is straightened by the Doctor the following day or a few days after the injection. Surgery – there are different types and your your surgeon will decide which is needed. Surgery is advised when the MCP joint (the one that connects the finger to the hand) is more than 40% bent, or the PIP joint (second finger joint from the tip) is more than 20% bent.